This image shows changes in the target landing area for Curiosity, the rover of NASA's Mars Science Laboratory project. The larger ellipse was the target area prior to early June 2012, when the project revised it to the smaller ellipse centered nearer to the foot of Mount Sharp, inside Gale Crater. This oblique view of Mount Sharp is derived from a combination of elevation and imaging data from three Mars orbiters. The view is looking toward the southeast. The larger ellipse, 12.4 miles (20 kilometers) by 15.5 miles (25 kilometers) was already smaller than the landing target area for any previous Mars mission, due to this mission's techniques for improved landing precision. Continuing analysis after the Nov. 26, 2011, launch resulted in confidence in landing within an even smaller area, about 12 miles by 4 miles (20 by 7 kilometers). Using the smaller ellipse, the Mars Science Laboratory Project also moved the center of the target closer to the mountain, which holds geological layers that are the prime destination for the rover. Landing will be the evening of Aug. 5, 2012, Pacific Daylight Time (early Aug. 6 Universal Time and Eastern Time). Figure 1 shows only the revised, smaller ellipse. 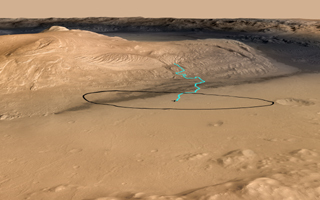 Figure 2 shows the new ellipse with one potential driving route to destinations on Mount Sharp. PIA15688 shows the same view as an anaglyph for three-dimensional effect when viewed through red-blue glasses with the red lens on the left eye. PIA15293 offers an unnanotated version of this view an a version with only the earlier, larger ellipse.